There have been many famous encounters with vampires over the years, from the folklore of old via John Polidori, Bram Stoker, yesterday's film Nosferatu, right through to more recent fare like Buffy the Vampire Slayer. The vampire shows no sign of slowing down as a presence in popular culture and there are still quality stories using the fanged ones for inspiration. Released in 2000, Shadow of the Vampire is a particularly good example of the ways in which an oft-used figure can be utilised to great effect in a (sort-of) original story. Based on a legend that sprung up around FW Murnau's Nosferatu that lead actor Max Schreck was in fact a vampire himself, the film follows a fictionalised account of Murnau's production. 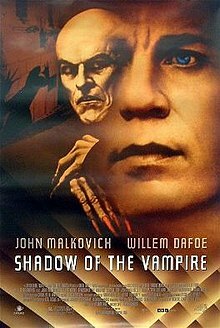 John Malkovich stars as the director who is so desperate for the authenticity in his unauthorised adaptation of Dracula that he hires a vampire (Willem Dafoe) to portray Count Orlock, subbing for Stoker's eponymous character. However, he promises the vampire that he can have the lead actress, Greta Schroeder in exchange for the performance, but it's not long before Schreck proves he is not easily controlled. Although played completely straight by everyone involved, there's a fair amount of comedy to be found in the film, particularly in Dafoe's wonderfully clever and affectionate portrayal of Schreck, capturing the mannerisms and expressions with ease. The way his vampirism is explained away by stressing the actor's links with Stanislavski is a lovely tongue-in-cheek nod to actors who still subscribe to method acting and the lengths they will go to for an accurate portrayal. Eddie Izzard makes the most of aping silent film performers in his role as Gustav von Wangenheim who portrayed Hutter in the original film and constantly reacting in bewilderment to Schreck's acting decisions. Malkovich too stands out as the tyrannical Murnau, an artist with a clear vision of the film he wants to create and an increasing desperation as it doesn't go his way. It's with Murnau that other parallels with another famous Gothic tale, Mary Shelley's Frankenstein. Although Murnau doesn't create Schreck in the same sense as the Creature from Shelley's novel, he does in a sense build him up to be a fictional figure, one which swiftly gets away from him. In a similar round of bargaining and negotiation, Schreck is promised Greta just as Frankenstein promising the Creature a mate and like the doctor, Murnau struggles to control his monstrous counterpart. There's another parallel between the Creature and Murnau's film itself, providing an intriguing analysis of the nature of storytelling and adaptation within this creation context. Just as Frankenstein must obtain a dead body to reanimate, Murnau must use the Dracula text to inform his adaptation, despite not receiving the authorisation to do so, but it's also cobbled together with Murnau's own changes as well as the differences that arise from having an actual vampire itself. The film is a creation that takes on a life of its own, despite Murnau's increasing frustration and his attempts to try and keep it all together. The film's final scenes prove to be quite chilling in this respect. There's very little this man won't do for his art. The idea of a creation taking on a life of its own is particularly interesting when linked back to Stoker's original novel and makes Murnau's efforts to stay in control seem all the more futile. By the time Stoker got around to writing his now infamous tale, many vampire stories had been appearing throughout the nineteenth century, constantly adapting the rules to suit their own narrative needs. Nosferatu continues that tradition, itself remade in 1979 by Werner Herzog. The very nature of storytelling is one of evolution as the tales get passed on from generation to generation and creative storytellers get to embellish the things they like or remove the bits that aren't so exciting any more. Dracula is perhaps the most classic example of that; the story has been adapted and re-imagined in so many ways that many people don't actually know the original narrative anymore. Shadow of the Vampire puts a new spin on the tale once again, moving it even further away from Stoker's source material, but in an affectionate way.